The comfort of reusables with the absorbency of a disposable. An environmentally friendly and cost-saving alternative to disposables. Garments that look and feel like the undergarments men and women have worn all their lives, not an adult version of a diaper. 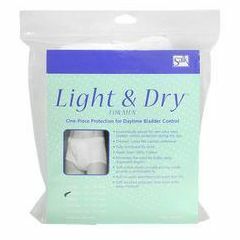 Light & Dry Underwear for Men are the perfect solution for active men with light incontinence who prefer a reusable underwear. The soft, breathable cotton is like wearing your own under-wear. Durable, quick-drying and stain-resistant, Light & Dry withstands repeated laundering without shrinking. It is much kinder to your budget - and the environment - than disposables! Lightweight contour shaping gives you a smooth, trim profile. Soft cotton elastic waist and leg bands provide a comfortable fit. The three-ply inner layer with fluffy fiberfill traps and holds moisture away from your skin. And like all Salk products, Light & Dry features well-crafted design for maximum durability and unparalleled comfort. Can't even tell I'm wearing anything. I wear these everyday with confidence that I can get through the day without embarassing accidents. My husband would not leave the house without these. He uses them like ordinary underwear. They are easily washed and used like normal underwear. He feels secure in social settings. Nobody suspects that he has a little problem. do these have a functional fly?